I was appointed to the ninth Chairman of the Board at the Board meeting following the Ordinary General Meeting on May 24, 2018. I would like to offer a brief greeting at the installation. First of all, let me take this opportunity to pay my respects to everyone who made efforts for developments of the Society. 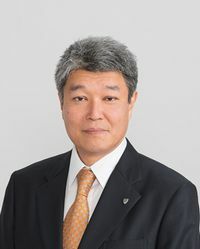 I would also like to express my sincere appreciation to the former Chairman of the Board, Takakazu Wada for his huge contributions to the Society, which were to promote activities directly linked to the missions of Certified Pension Actuaries during his term as Chairman, such as building and operating the Continuing Professional Development (CPD) program with the aim of maintaining and improving knowledge and skills in providing professional services of Certified Pension Actuaries, as well as issuing "Actuarial Standard of Practice in relation to funding of Defined Benefit Corporate Pension Plans" and "Actuarial Guidance in relation to Defined Benefit Corporate Pension Plans" in line with the deregulation that allows for more flexible contributions and benefit designs for defined benefit corporate pension plans. With regard to the corporate pensions, the stricter regulation on governance of the defined benefit corporate pension plans has been enacted following the deregulation in January 2017, while a series of legal amendments including an expansion of the coverage of defined contribution pensions have been also enacted, resulting in an increase in the importance of Certified Pension Actuaries' involvement from the aspects of plan design as well as funding. The Society aims to widely diffuse and develop pension systems, and contribute to enhancing the financial well-being and welfare of citizens by engaging in the required business activities. Under this mission, we will continue to monitor the changing environment, revisions of domestic and overseas pension systems and accounting standards, and extend the focus beyond problem-solving for current practical issues to researching in the medium and long term on the financial stability of pension programs, as well as researching and recommending on regulatory issues of corporate pensions. The International Actuarial Association, of which the Society is a full member, will be implementing its amended education syllabus in January 2021. Consequently, the Society has decided to review its educational systems including its actuarial examinations and the CPD program, and seek cooperation and support from related institutions in order to continue fulfilling the trust of the global community as a professional society. The year 2019 marks the 30th anniversary since the Society was founded in April 1989, which will be celebrated by various events, which include hosting a symposium and publishing a commemorative publication. The Society will further promote public-interest activities to diffuse and develop corporate pensions. All Directors, including myself, are resolved to do our utmost for the future development of the Society. I sincerely hope that you will continue to support its endeavors.